If you want to avoid spilling when you are pouring liquids in the kitchen you may appreciate a funnel. Funnels are not only useful tools in the kitchen. Light can also be efficiently concentrated with funnels. In this case, the funnels have to be about 10.000-times smaller. An international team of scientists from the Korea Advanced Institute of Science and Technology (KAIST) in Daejeon (South Korea), the Max Planck Institute of Quantum Optics (MPQ) in Garching (Germany), and the Georgia State University (GSU) in Atlanta (USA) has now managed to concentrate the energy of infrared light pulses with a nano funnel and use the concentrated energy to generate extreme ultraviolet light flashes. These flashes, which repeated 75 million times per second, lasted only a few femtoseconds. The new technology can help in the future to measure the movement of electrons with the highest spatial and temporal resolution. Light is convertible. The wavelengths composing the light can change through interactions with matter, where both the type of material and shape of the material are important for the frequency conversion. An international team of scientists from the Korea Advanced Institute of Science and Technology (KAIST), the Max Planck Institute of Quantum Optics (MPQ), and the Georgia State University (GSU) has now modified light waves with a nano funnel made out of silver. 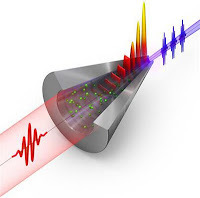 The scientists converted femtosecond laser pulses in the infrared spectral range to femtosecond light flashes in the extreme ultraviolet (EUV). Ultrashort, pulsed EUV light is used in laser physics to explore the inside of atoms and molecules. A femtosecond lasts only a millionth of a billionth of a second For more details Click here .